(NaturalNews) Today we're making history in the survival food industry. I've partnered with Numanna, a rising storable food company run by patriotic Americans, to co-formulate and lab certify an entire line of near-instant meals that are certified organic, non-GMO and use no hidden forms of MSG. 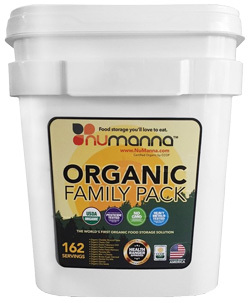 Click here to learn about the Numanna Organic Family Pack - Health Ranger Approved survival food. If you look at the ingredients used by popular survival food companies, you'll be shocked to learn they all use pesticide-laden non-organic ingredients, and nearly all the companies use GMOs as their primary materials (soy and corn). Every single survival food company we researched also turned out to use hidden forms of MSG such as yeast extract, hydrolyzed proteins or autolyzed proteins. Many companies also used partially hydrogenated oils, artificial colors and chemical taste enhancers. WISE Foods, for example, uses partially hydrogenated genetically modified soybean oil, maltodextrin from GMO corn and hydrolyzed corn protein. Mountain House relies on partially hydrogenated soybean oil, corn gluten and hydrolyzed vegetable protein. Patriot Pantry uses propylene glycol esters, hydrolyzed corn and disodium inosinate. No matter where you turn in the industry, nearly every single one of these survival food companies is using GMOs, hidden MSG or ingredients grown with the use of chemical pesticides and herbicides like Roundup (glyphosate). The bottom line? If you think living on pesticides, GMOs and MSG while the world collapses around you, keep on buying the total crap sold by the survival foods industry, which seems to be run by people who have good intentions but are completely clueless about nutrition and food science. 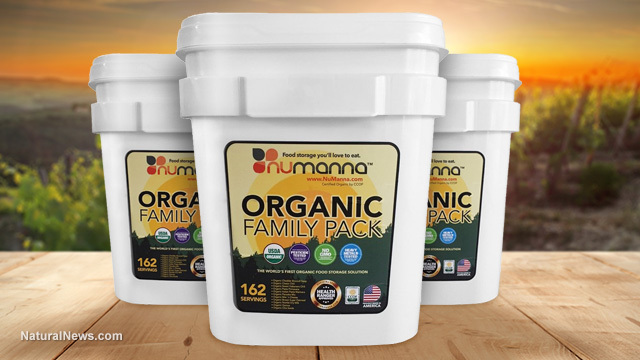 If you want clean, laboratory validated, certified organic food with quality, nutritious ingredients, check out the Numanna Organic Family Pack instead. Or click here to order this survival food at the Health Ranger Store. 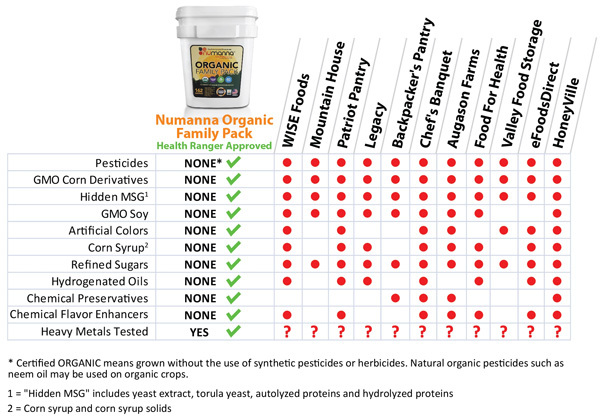 Numanna's Organic Family Pack, Health Ranger approved, is made with authentic, wholesome, organic and clean ingredients. We don't use GMOs, either. No hidden MSG. No corn syrup ingredients. No maltodextrin, hydrolyzed corn or autolyzed yeast extract. We don't use those ingredients because we want our storable food to be wholesome, not toxic. Truth be told, most of the non-organic food ingredients used in storable food products are grown with chemicals designed to KILL things. That's the whole point of pesticides: to KILL anything that tries to eat the food. GMO corn is also designed to poison insects that try to eat it. Every kernel of that corn is engineered to produce a toxic insecticide that kills a living creature. This is what you end up ingesting when you eat that same corn product. Sadly, most emergency food products are made with corn, rice, wheat and barley that's sprayed with deadly insecticide or herbicide chemicals. That's why it's really "death food" rather than emergency food to support life. Only Numanna's Organic Family Pack is food for LIFE! This is storable, organic food that's loaded with more nutrition, more omega-3s, more high quality proteins and vastly higher grade ingredients than any other survival food product on the market today. Shipping is FREE to the 48 states. We have thousands of units in stock right now, but they probably won't last long, given the insanity that's happening in our world right now. With this launch, we now set the new standard for safe, clean, nutritious survival food. Nothing else comes even close. If you want to be healthy in a survival situation -- rather than filled with pesticides and GMOs -- this is now your single best choice across the entire industry. Remember: Compared to this, everything else I could find in the marketplace was total crap. Read the ingredients yourself! Find out what kind of toxic garbage the other companies are selling you while calling it "survival" food. It's a joke! Click here to order survival food now at the Health Ranger Store.